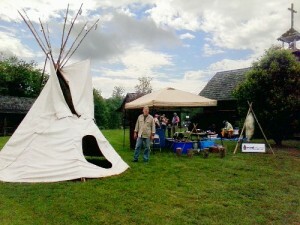 Each year I enjoy setting up my Cheyenne style teepee that adds to the atmosphere of the event while I give demonstrations of primitive and survival skills. Flint and steel firecraft is a given for me while fellow craftsmen demonstrated flint knapping, black smithing, red oak chair construction along with other demonstrations of heritage crafts. After setting up my display I was approached by a 71 year old woman who with great enthusiasm announced that she was a Prepper and was actively making provisions for potential natural disasters or other catastrophic events. I listened as she shared the variety of activities she did in this pursuit. I asked her if she had ever made a fire using a ferro rod and she replied “no”, so I asked her if she would like to learn how, to which she enthusiastically replied “yes!”. I pulled out one of my ferro/mag bars and showed her the construction and purpose of the design and then demonstrated the technique of pulling the rod out from under the striker to keep the sparks centered on the tinder and thus not disturbing the tinder pile by using the opposite approach of striking down the rod with the striker. I handed the device to the woman and had her take a few practice sparks. We learned that this larger ferro/mag bar was an asset because of her arthritic condition and enabled her to hold it well enough for the task. She had success on the first strike! It’s moments like this that make these events so rewarding. She was able to walk away with a new skill that now helps her to be better prepared. It’s also refreshing to see the festival craftsmen demonstrate their skills so that we can become better prepared too. This entry was tagged Daniel Boone, Demonstratons, Festival, Teepee. Bookmark the permalink. My Mom was so thrilled at learning to start a fire. She still talks about it. she has a gas fireplace and a wood fireplace in her log home.